Home > Heavy Duty V Belts > Moulded Notch V-Belts. AX, BX, CX, 3VX and 5VX Sections. > AX Series. 1/2" Wide Molded Notch V-Belts > AX35 Bando Power King Cog V Belt. Classical AX35 Industrial V-Belt. > AX34 Bando Power King Cog V Belt. Classical AX4 Industrial V-Belt. AX34 Bando Power King Cog V Belt. Classical AX4 Industrial V-Belt. AX34 BANDO Power King Belt. Classical AX34 Industrial COGGED V-Belt. 1/2” Wide x 36” Length OC (13mm W x 914mm L OC). COGGED V-BELTS are better suited for bending around smaller pulleys and deliver more power. Features bias cut, insulated ultra-high strength polyester cords, superior compression section for high temperature and load carrying performance. Meets or exceeds RMA standards for Heat and Oil resistance. High quality for low cost! NAPA, Grainger, PIX (low grade) AX34. Woods Mowing Machine AX-34 belt. 4L360 FHP V-Belt. Industrial Brand. 1/2” W x 36" Length. Replaces Classical A34 V Belt on light duty applications. AX35 Bando Power King Cog V Belt. Classical AX35 Industrial V-Belt. AX35 Power King V Belt. Classical AX35 Industrial COGGED V-Belt. 1/2" Wide, 37” Length OC (889mm). 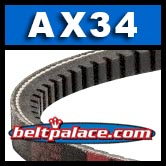 Replaces Standard Raw edge A35, 4L370 FHP V-Belts.